Before we get started, if you want to know my biases for Neko hairstyles, feel free to consult my first post on this matter. Rule #1? Human ears underneath Neko ears look strange… cover them please! Okay, without further ado…. Next on our lovely line-up of handsome Nekos is Matty Luminos, who generously provided a large number hair recommendations, two of which are featured here. Imso was first featured in this blog’s “Purrfect Neko Family” story in August. 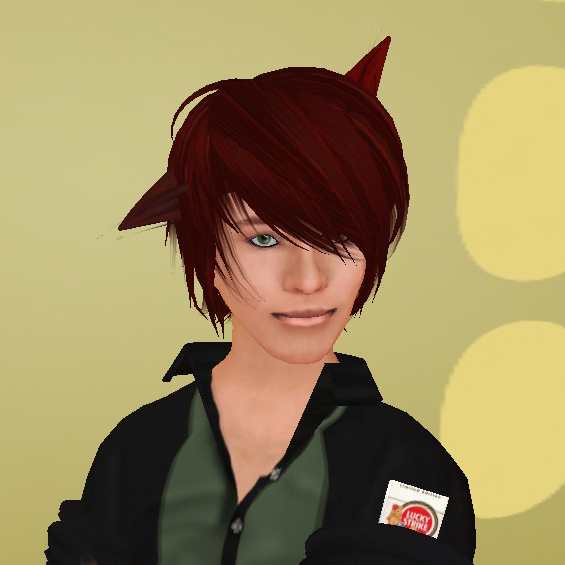 He’s a super creative guy who enjoys DJ’ing in his spare time, when he’s not hanging out with his fellow Neko family members and friends (in SL and RL!). In the above picture, Imso is wearing Deviant Kitties‘ “Uruha” hairstyle (in white). (Note: when you arrive at Deviant Kitties / Ploom, wait for rez, until you see a black sign in the front window of the store, which will teleport you up to the Deviant Kitties store). Spotted during one of his rare Neko moments, this handsome (usually human, not to mention vamp) guy is the male model at EarthStones (one of this kitteh’s most favorite places for yummy jewelry). 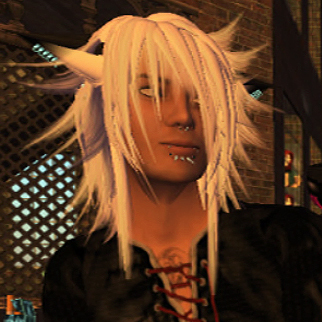 Prior to his career in assisting with jewelry sales (simply by making women swoon while they’re visiting EarthStones), Wes’s early years often found him running around the metaverse as a Neko — wearing this excellent skin from Nomine, tattoos from Inflict, and Kin’s “Sierra” hair style. If you’ve got a favorite Neko hair style for guys that’s not shown above, please submit a comment below and share. After all, helping your fellow male kittehs look their virtual best is an honorable public service to all us female kittehs. Purrrrr…..
~ by Stacia Villota / Virtual Neko on September 24, 2008. God, they all look awesome! What a great line-up of hairstyles! I can see I’ll be doing some shopping. FYI, the hairstyle I’m wearing from Gritty Kitty is actually called “Czech Mate” (gotta love a good pun)…I hope I didn’t get it wrong in my email to Stacia, although that’s entirely possible. Always a pleasure to be of some assistance to someone, that tries to help whomever wants to upgrade theri image, which i think it´s pretty important, eben amongst males, lol. Apart from that i do advise Deviant Kitties, with lots of wonderfull, out of the ordinary, rebel hairs, eventhough i, in the almost 2 years of SL, only used 2 diferent hairs..One before i mutated, and one (this one) since i became a Neko. Keep up the good work, anything u may need just contact me. Here iz a pic of meh in both, ackshully! Selos iz teh ponytail, an Ember iz teh long hairs. I was wondering. ummmmmm Is there any Neko kids stuff about for boys. Hard to get stuff that fits. Correct you are. Great lengths are always taken when it comes to anything “neko”… Glad this post was able to help..